How to Calculate P/E Ratio: The Most Widely Used Valuation. 4/7. For this part of Investing for Beginners 101, I’m going to help beginning investors do their own research in stocks and show how to calculate P/E ratio from a company’s 10-k annual report. This guide will have pictures and links to make it very easy to follow and learn the procedure. The 7 steps to understanding investing are as follows. In order to research companies and evaluate whether they are good stock buys, you really don’t need any special skills or education. In fact, if more people knew how to research stocks and took the time to do a little research on some companies, I think a lot of so called experts and mutual fund managers would be out of work! [Tweet This] Unfortunately, this hasn’t been the case and for whatever reason, individual stock picking has been frowned upon as reckless and risky. In reality, picking individual stocks leaves all the responsibility of your money on yourself, a taboo way to think for sure. In a culture where it’s never your own fault and always someone else’s, no wonder the average investor flocks to mutual funds every year. If more people took responsibility for their own money and were willing to see their portfolios drop in value without selling at the worst possible time, there’d be more happy and increasingly profitable investors. 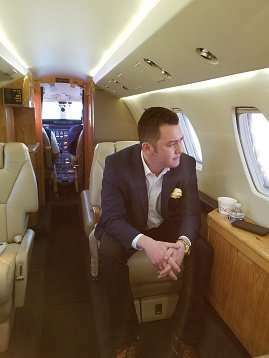 My hope is to see more investors educating themselves and making smart, disciplined stock picks with the long term in mind. Arguably the first thing you should learn about individual stock picking is how to calculate P/E ratio from a company’s annual report. P/E ratio simply measures how much you are paying for a company’s earnings, the higher the ratio the more expensive the company. A higher P/E ratio generally means a company is more popular and more people are buying this stock. P/E ratios vary based on industry and based on market conditions, and you can tell when the market is overvalued because the average P/E ratio is high. An average P/E ratio is about 17, and I only look for companies who have a P/E below 15. Most fundamentalists agree that any P/E over 25 is too high, regardless of the industry or market condition. Stocks with high P/E ratios tend to have great stories and the most optimistic of futures, but as the stock becomes more and more overvalued the bubble eventually pops and everyone who bought in when the company had a high P/E ratio lose money. The thing with buying these stocks with high P/E ratios is that there is no way to tell when the price of the stock will catch up with its valuations, meaning when the stock prices crash to normal levels. While you can make some nice short term gains from buying stocks like this, using this strategy regularly is essentially gambling and it is not an investment strategy I promote. I buy companies with low P/E ratios for two reasons. If you look at various studies, there has been a proven correlation between low P/E ratio and above average returns. What Works on Wall Street by James O’ Shaughnessy showed multiple back tests proving this, and also there have been articles on the Motley Fool website confirming the correlation. To look up a company’s earnings from their annual report, go to this website: SEC Filings. Type in the company’s ticker in the search bar, as an example I’m going to show how to calculate the P/E ratio for Ford (F). Once the company is found, type 10-k in the filling type box. Find the latest filing date and click on documents for the 10-k. From there, click on the .htm link for the 10-k, in this case the first line. Note: Sometimes the company doesn’t put their income statements on the “10-k” and instead will file it under exhibit 13. This is a rare case though and you will be able to quickly tell if a company did this after clicking on the 10-k .htm file. Now, we want to find the Consolidated Statement of Earnings. (Sometimes called Consolidated Statement of Income, sometimes called something completely different). Most of the time the Statement of Earnings is right above the Balance Sheet, occasionally it’s below. 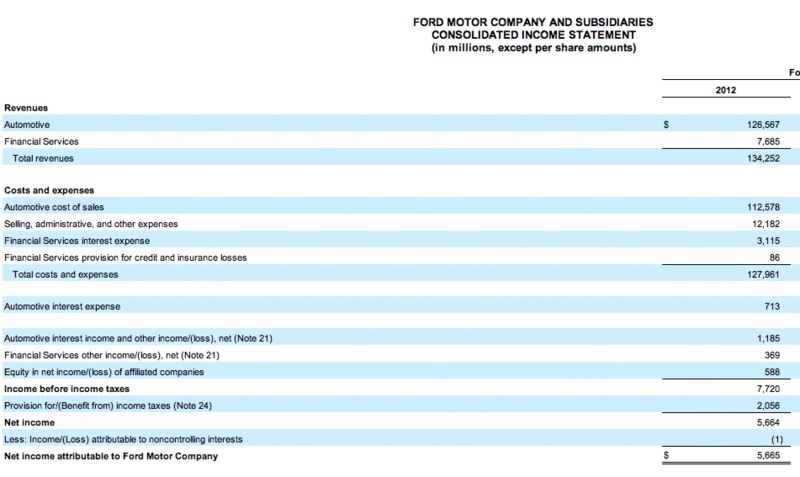 Scroll up until you see the income sheet, and look for Net Income attributable to Ford Motor Company. In this case for 2012, you can see it’s $5,665 million. Now that we have the earning number, we want to calculate market cap. You can google a company’s market cap, which is updated regularly on most financial websites. If you want to be detail oriented like me, or be able to look up a company’s market cap for previous years, search the 10-k document for “shares outstanding”. Once you have the number of shares outstanding for 2012, simply multiply this by the share price to get the company’s market capitalization. Note: You always want the Diluted number for shares outstanding, as it is more accurate (takes into account employee stock options). So, once you have these values, simply take market cap/ earnings to calculate P/E ratio. 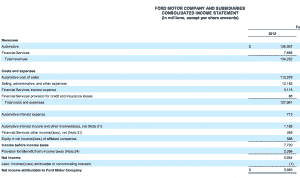 For Ford, using today’s stock price of $13.36, we get a market capitalization of $53.6 Billion. Divide this by the earnings, $5.6 Billion, and the P/E is 9.46. Auto makers tend to have a low P/E due to the industry, so compare to its competitors to see if the ratio is favorable. Keep in mind that most P/E ratios you see on financial websites are calculating future earnings, based on projected numbers. Thus, these numbers can fluctuate greatly and quickly, which is one reason I like to use past earnings to calculate P/E ratio. I also like to average the past 3 years of earnings to make my calculations more accurate and with a longer term outlook. Depending on the rigor of the analysis, I’d also recommend to calculate P/E ratio over an average of 7 years of earnings, as Ben Graham did in his book The Intelligent Investor.